Stevia, a plant-based sweetener is increasingly being used as a substitute for sugar and other artificial sweeteners. Stevia has no calories, and it is 200 times sweeter than sugar in the same concentration. Though stevia is categorized as Generally Recognized As Safe (GRAS), few long-term studies have been done to document its health effects in humans. One study of human subjects showed that treatment with stevia may improve glucose tolerance. Another found that stevia may induce the pancreas to release insulin, thus potentially serving as a treatment for type 2 diabetes. And while they have conducted several clinical studies on stevia and concluded that it is safe for human use, there is a general lack of long-term studies on stevia’s use and effects. 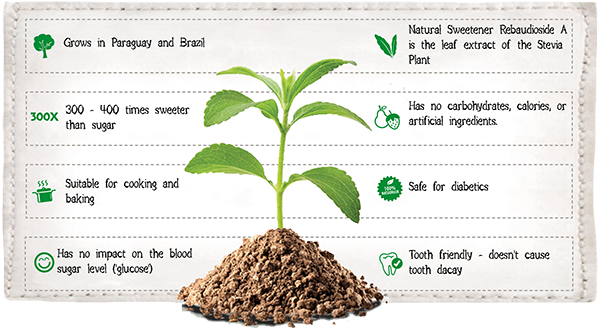 To conclude, stevia’s sweet taste and all-natural origins make it a popular sugar substitute with little long-term outcomes. It is possible that stevia in large quantities could have harmful effects. However, it seems safe to say that when consumed in reasonable amounts, stevia may be a natural plant-based sugar substitute.